The restaurant is located in Huis Ten Bosch amusement park. That’s in Sasebo, one hour north of Nagasaki, Japan. We got there at 4:30pm but realized they opened at 5pm. We grabbed a light bite of food and ice cream outside. The robot restaurant is located right above Sausage Swaag. We had to ask strangers (Japanese) to take this photo and they were confused as to why we thought it was funny. At 5pm, we made our way in as the first customers of the evening. As we made our way to the top of the stairs, we didn’t see anyone in the front. We walked in further and saw a few workers talking in the back. They soon noticed us standing there and came towards us with a warm greeting. Overall, there weren’t many people at Huis Ten Bosch park so I guess they’re used to not seeing customers. We asked for a table for 2 and then they charged us 6000JPY (3000JPY each). I was a little confused by this, then looked around and didn’t see a menu. That’s a pretty high price for a meal at $27 USD! I assumed this was a set course type of meal and paid up. We saw robots so I was about to pay no matter what they served. After walking around the restaurant we realized that it was a buffet. 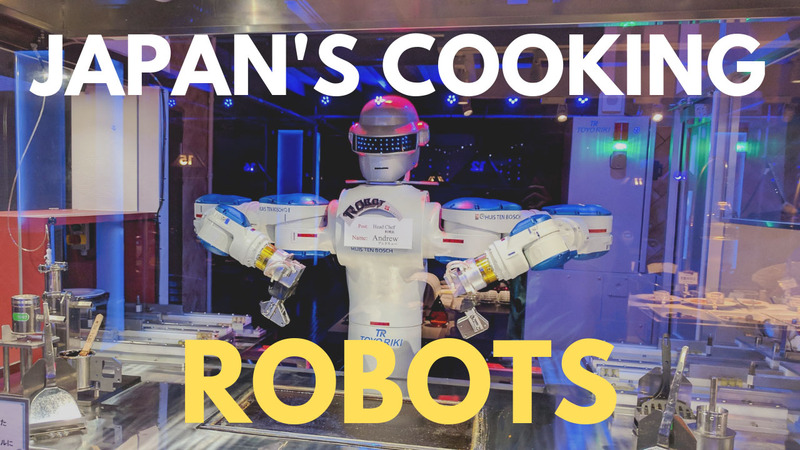 There were 3 robots chefs. One made alcoholic drinks (at a price), the next cooked a plain okonomiyaki, the last one served ice cream (at a price). It’s an expensive Japanese buffet that charges for drinks and dessert. For me, this was definitely a one-time visit but worth the experience. To get a drink from Daneel, you’ll have to place an order on the screen to the right of him. It’s 600JPY for alcohol and 300JPY non-alcoholic drinks. The alcoholic drinks include beer and simple cocktails such as highballs and screwdrivers. Daneel pours you the drinks but you have to mix it yourself. No tip for you Daneel. Lazy robot. When Daneel isn’t serving up mediocre beverages, he likes to dance. Andrew makes all the okonomiyaki in the place. But the way he does it, it’s a Japanese pancake with no toppings. Pretty weak Andrew. He also takes a very long time to cook. The amount of tasks they have this robot run through is very impressive though. No charge for the okonomiyaki, a worker (human) brings it out and adds it to the buffet line. As you walk by the last robot, you’ll notice he like to sing. That’s Yaskawa-kun and he likes to sing. He’ll give you soft serve ice cream in a cone for 200JPY. To make this request, use the screen to the right of him. Once paid for, he’ll make your ice cream pretty quickly. If money isn’t an issue (I’m super frugal) I’d go again. Otherwise this is a one-time experience. If you add in the cost of getting in to the park (full day) and eating here, you’re looking at around $100 USD already. It’s hard to justify it when there’s no rides or super rare attractions. For that kind of money, I could stay in a capsule hotel, get super fluffy pancakes, go to a robot show, and then an all-you can drink maid bar in Tokyo. Also for the experience, I stayed at the Henna Hotel (robot hotel Japan) which is connected to Huis Ten Bosch. That was an experience I’d like to forget.